Expressed Sequence Tag Treatment and Investigation Kit is a tool dedicated to the analysis and annotation of cDNA raw data. This tool was optimized for the investigation of data related to tropical crops and combines an automatic pipeline, a database and Web interfaces to consult and download data. The ESTtik analysis and annotation pipeline program is a set of Perl packages which contain a main program related to 9 modules in charge of completing different processings. The pipeline executes a series of programs to assess quality and nucleotides from chromatograms, then edits, and assembles the input DNA sequence information into a non-redundant data set. This unigene is then searched for microsatellites and SNPs. 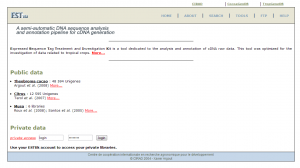 It is used as input for an annotation against public databases including an extraction of Gene Ontology terms. The information collected from individual program modules of the pipeline is stored and organized into a MySQL database. The database model was specially designed using the UML technology to fit data. It offers the possibility to create public and private project linked to different users. Therefore private data are only available for people who log on.